AMP Radio Network is an innovative location-based marketing and advertising company with expertise in creative audio production and technology that offers next-generation marketing solutions. The AMP Radio Network allows advertisers to cost-effectively target consumers on a regional, local and location-specific level. AMP’s network location partners benefit from reaching the customer at the point of purchase while advertisers benefit from the location’s captive audience. 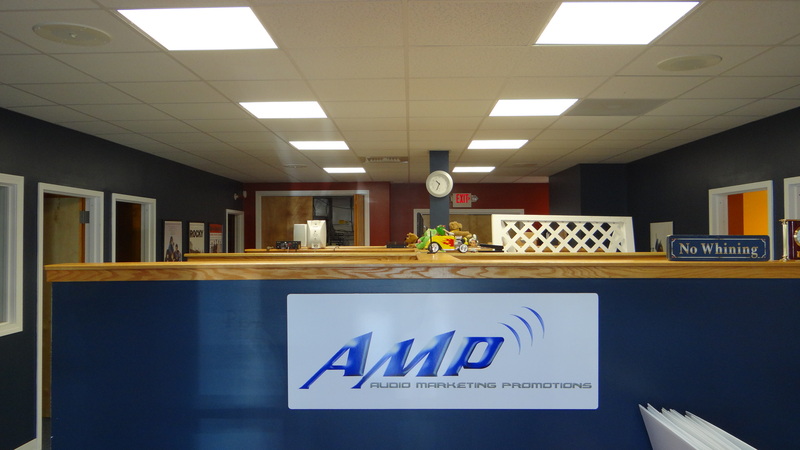 AMP Radio Network also provides clients with a state-of-the-art audio production studio, voiceover creative, and a full-service advertising agency. Whether you’re interested in taking your advertising outside of the box or would like to become part of our network, our mission is to pick up where traditional media falls short. AMP Radio Network provides national, regional and local advertisers the opportunity to deliver their messages directly to the consumer with laser focus. AMP Radio Network allows clients to reach their target audience cost effectively by geography and lifestyle. The soft drink company can reach the consumer outside the convenience store, the dry cleaner can reach the neighborhood commuter who passes through the area every day, the mortgage company can reach its entire target region - all at a fraction of the cost of traditional radio and television. With the AMP Radio Network, the reach is focused, the frequency is increased and the consumer can't change the channel. AMP Radio Network is an innovative location-based marketing and advertising company with expertise in creative audio production and technology that offers next-generation marketing solutions. The AMP Radio Network allows advertisers to cost-effectively target consumers on a national, regional, local and location-specific level. AMP’s network location partners benefit from reaching the customer at the point of purchase while advertisers benefit from the location’s captive audience. AMP also provides clients with a state-of-the-art audio production studio, voiceover creative, and a full-service advertising agency. Whether you’re interested in taking your advertising outside of the box or would like to become part of our network, our mission is to pick up where traditional media falls short. AMP Radio Network provides national, regional and local advertisers the opportunity to deliver their messages directly to the consumer with laser focus. AMP Radio Network allows clients to reach their target audience cost effectively by geography and lifestyle. The soft drink company can reach the consumer outside the convenience store, the dry cleaner can reach the neighborhood commuter who passes through the area every day, the mortgage company can reach its entire target region - all at a fraction of the cost of traditional radio and television. With the AMP Radio Network, the reach is focused, the frequency is increased and the consumer can't change the channel.